The Windows Vista taskbar (that little strip at the bottom of your screen) is the one place you can get to quickly, easily, from any place in Windows, at any time. As a timesaver, the taskbar takes the cake. You can use it to access all of your open programs. The problem comes when you have so many programs or files open that you can’t see all the buttons at the same time. You can expand Vista’s taskbar to see more of what’s there. Right-click an empty part of the taskbar and uncheck Lock the Taskbar. 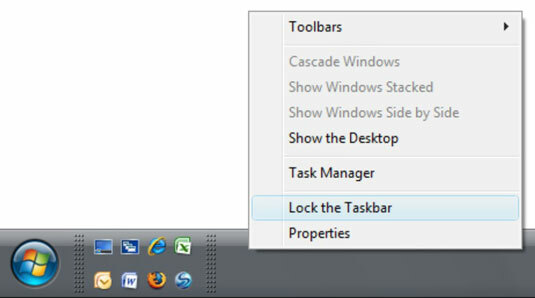 Before you can change the taskbar, you have to unlock it. When it’s unlocked, you can see a pattern of dots immediately to the right of the Start button. Hover the mouse pointer over the top of the taskbar until you see the double-headed arrow. Click and drag upward to make the taskbar taller. If you’re running at relatively low resolution, you probably want the taskbar to be two lines tall. At higher resolutions, on better monitors, three can help. Right-click the taskbar again and check Lock the Taskbar. Your taskbar now looks something like the one in this figure. Note that the area on the right — called the notification area — now shows the date as well as the time. When the taskbar is unlocked, you can move it to the top, left, or right side of the screen by clicking in an unused area on the taskbar and dragging it. Because it’s relatively easy to move — and most people don’t want to move it — it is also easy to move accidentally. Leave the taskbar locked unless you specifically need to unlock it.